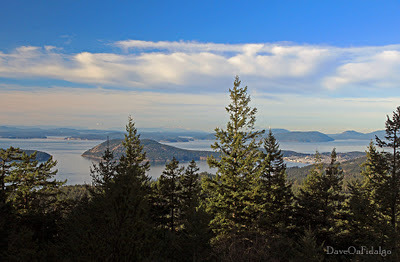 Mount Erie is an Anacortes City Park and a part of the Community Forest Lands. 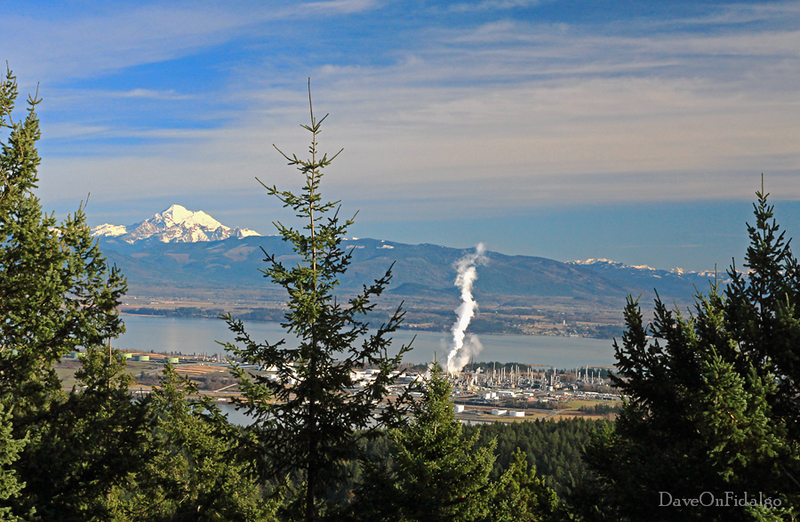 It is a popular spot for hikers, rock climbers and hang gliders. It is also possible to drive a steep, winding road to the summit. There are overlooks providing spectacular views of the surroundings. Above, Mount Baker presides over the North Cascades, Padilla Bay and the oil refineries on March's Point. 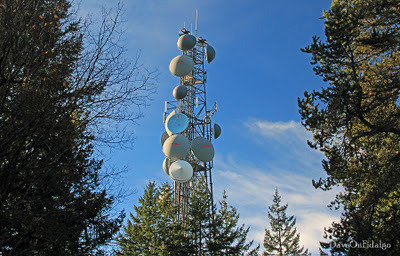 The morning of my visit to the summit was chilly, below freezing with patchy fog in some areas. 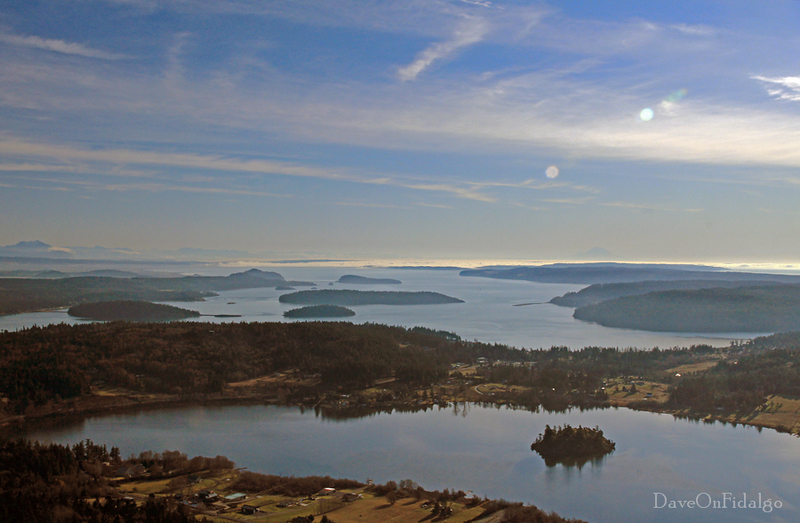 Looking northwest, Burrows Island and the Skyline neighborhood of Anacortes can be seen. Beyond are the San Juan Islands. An interesting sign on the road to the summit warms visitors of owl attacks during the early morning and evening hours. Perhaps these are the original "angry birds." I was spared their wrath during this visit. A pair of transmission towers crowns the summit of Mount Erie. 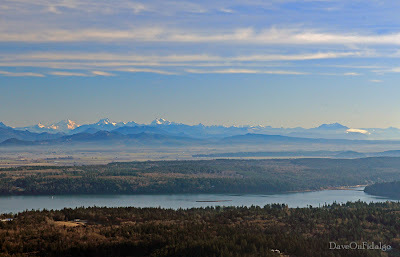 To the east, the peaks of the North Cascades can be seen through lifting fog. Finally, looking southeast is Skagit Bay which is my neighborhood. Lake Campbell is in the foreground. As we approach the winter solstice, the low sun just out of view to the right is wreaking havoc with the camera. Look carefully at the horizon towards the right. 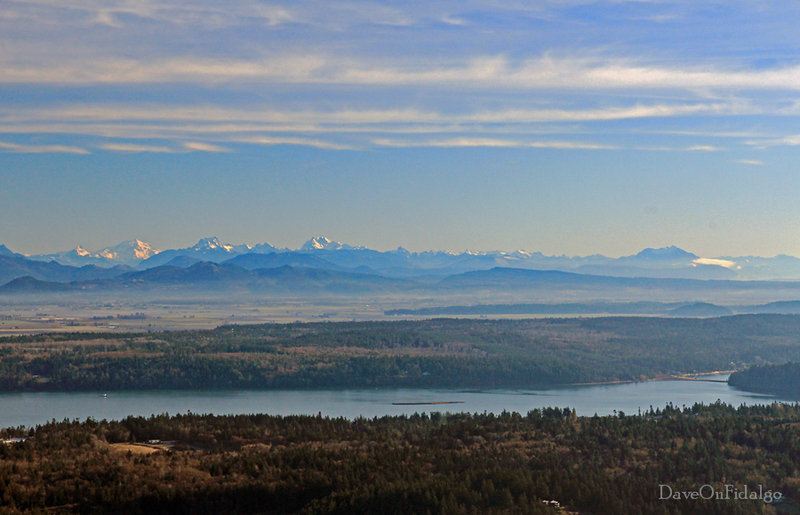 I believe the peak barely visible in the fog is Mount Rainier, 118 miles/190 km away. This is yet another attempt to get a really great photo of this view. I guess I will need to keep trying.